Looking at the picture of my boat. 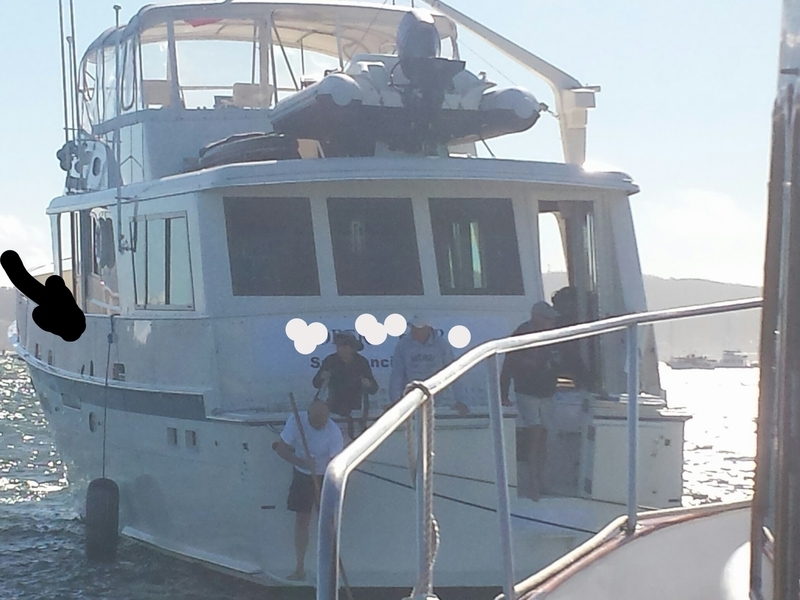 Should the anchor bridal be from the two side cleats and extend so when slack the anchor hook does not rub the hull? Or should I run the anchor bridal from the forward deck chocks? I am using all chain rode that is 5/16" HT. What is the best anchor chain hook to use that will not foul or let go of the chain? I am trying to set my new to me boat up so that I don't have regrets on hind sight. I'd run it from the forward deck chocks. Make sure you have some anti-chafing tubing on the line there (we just used the velcro stuff from Davis). Some kid of devil's claw hook or chain plate works well. You don't have much of a pulpit at all, so I'd be a little less worried about that, BTW. I have a similar bow chock arrangement as you on my boat, so I use a bridle that is long enough so the chain hook doesn't drop down and hit the bow and make noise in light winds. There are special hooks made for anchor snubbers such as Wichard's and Seadog's, but I used an inexpensive grab hook which has never dropped off the chain. Due to the geometry, I don't think a hook on a bridle would ever drop off. I use a Mantus bridal. Works great for both anchoring and mooring ball. At 25 feet, it is good in awful weather and can be shortened by cleating. As George noted you don't really have a pulpit to worry about. I wouldn't bother with a bridle. 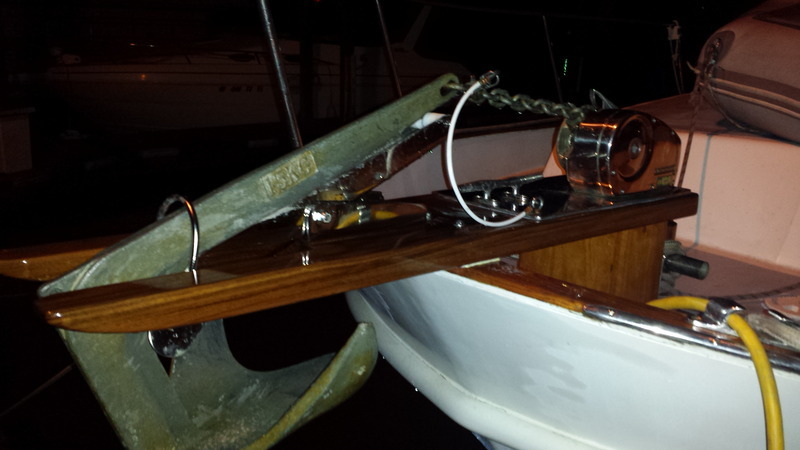 Either tie/loop the snubber line to your bollard with chafe protection or cleat it off to one of the bow cleats. Cleating it off at an angle has the advantage of, in many cases, reducing sailing at anchor. There are a number of chain "hooks" you can use. They all have there proponents. It stretches to reduce the shock loads and unload the chain to the windlass. If it was to fail, the chain would take up the load. I wouldn't worry about damage to your anchor roller during a blow. It looks pretty stout and no pulpit to damage. You can run the single line over the anchor roller and secure it to your sampson post. It's an easy process to snap the Shockle to the chain then release more chain as you guide the line into the roller, then a couple wraps on the post, slacken the chain and you're done. Normally I anchor with enough rode that I've got more than just the 120 ft of chain out. That's when I secure my 8 ply Brait to my pulpit cleat to unload the windlass. What windlass, and what wildcat can handle the Brait? I heard that most chain + line wildcats don't get enough grip on brait? I have used a chain grabber for years. It allows me to use a bridle rather than just a single line. "I am using all chain rode that is 5/16" HT. What is the best anchor chain hook to use that will not foul or let go of the chain?" A better question (from the tests by Practical Sailor) is which hook will not weaken the chain by 50%? Answer a line tied on. Me too. I just went to HD and got a galvanized chain hook for $3. Works well and even drops off much of the time when the anchor is being hauled. I read that same article in PS. I use a simple chain hook now, but that testing made me question that decision. I have a combination rode with 90' of chain, so if the weather is going to be really bad I usually have enough scope out that my attachment is rope anyway. I have a Lewmar 1000 with the standard gypsy. When I ordered the rode with the windlass from Defender, I was advised to upsize the 8 ply Brait by one size to allow for a proper grip in the gypsy. It's been flawless in 6 years of service with lots of anchoring. For example, I just returned from a 4 day fishing trip. 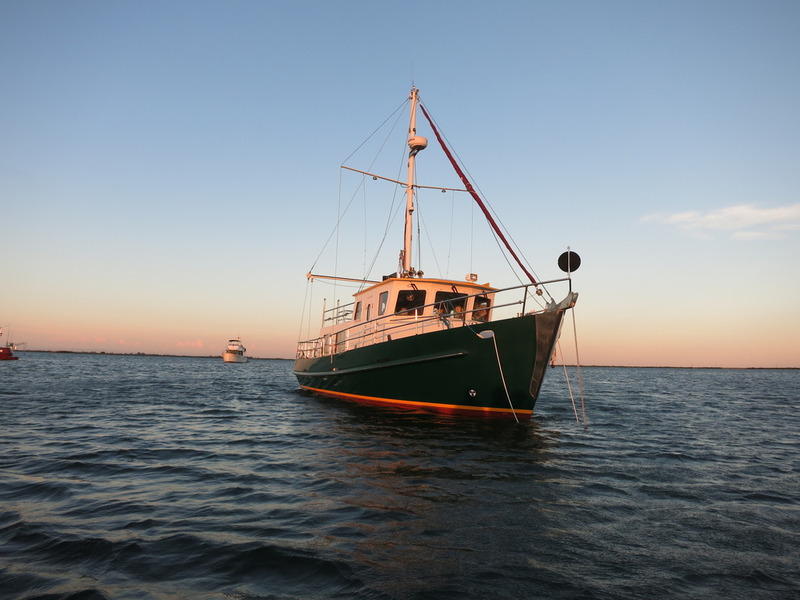 I probably anchored 4-5 times per day at various fishing holes and overnight anchorages.
" But I have read several posts here where the bow pulpit was torn up in heavy winds." I Must have been absent when those were posted. I cant think of any problems with the bow pulpit related to anchoring. If you want to transfer the loads from the chain where it comes onto your bow roller, to somewhere else on your foredeck, with the cleat position and chock positions as shown in your photo, I suspect you will need to use some anti-chafe leather or vinyl hose where the nylon line from your snubber bridle comes over the edges of the deck. Whether you use three stand or braided (not "brait" as you and others are now calling it) line is relevant only to the ease of splicing in a loop where the chain hook is attached. Either will work, and nylon is best, as it has some stretch that dacron or other higher tech lines won't have. My preference is to have the chain hook at the waterline or slightly above, with a sag in the chain, so you know the snubber is taking the weight of the chain. I have never seen the snubbed chain try to come close to the side of the boat, as the weight of chain is sufficient to keep a constant load on the snubber lines, no matter what the wind or waves are doing. Whether you use a bridle or just a single line is your choice, as the purpose of the snubber is to transfer the loads in such a way as to free up the bow roller and the windlass gypsy, to a cleat that is strong enough. A single line will do that, and if your bow roller is strong enough, you may wish to lay a single line snubber alongside the chain and take that line directly to the cleat. From your picture I can't see whether you in fact have a properly positioned cleat. On my boat, that works well, leaving my deck cleats free for other uses. As pretty as your pulpit is I'd be afraid to use the anchor. Al, I'm not sure why you didn't change to steel when you had your anchor pulpit replaced. If you had one previously, you may not have been damaged when the other boat impacted. Thanks, Bill, but she gets lots of use. Even held a 65 ft Hatteras in pickle fork fashion. The Hatt's got the holes to prove it. The anchor held us both with scrape damage to the pulpit, a cracked caprail and a few popped lag bolts. I was able to retrieve my anchor with the windlass and bent anchor roller. Because it's not as pretty to my eye and would have been completely out of place on my 1977 FG boat with pretty teak trim. It's not brait, it's Brait, as in a trademarked proper noun. Check it out here. It's 8 ply and can be a challenge to splice properly.